This fine walk has several things going for it: it includes a fine section of ridge; much of it is well off the beaten track; and it allows an exploration of the area south of the col du Alpe. It's also a relatively gentle day. Although it is graded as Difficulty 2, this is only because of a short rocky descent with a slightly awkward move, and it really shouldn't put anyone off who is reasonably agile. The starting point is les Varvats (1042 m, grid ref. UTM 31T 72587 50328) - a small group of houses elevated 250 metres above St. Même with the advantage of a small parking area for a dozen cars. 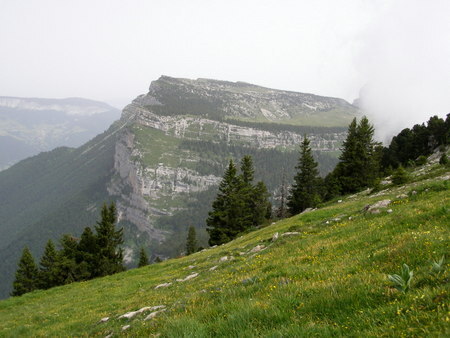 From here, the route follows the Tour de Chartreuse as far as the Habert de la Dame; ascends the pasture known as l'Alpette up to the eastern crête; and follows this north to just before the col de l'Alpe where it swings south-west to descend the Vallon de Pratcel back to the car (map). From the car park follow the track trending south-east for half an hour to where it crosses a small stream, with a reservoir on the left. The track morphs into a steep bouldery path on the other side of the stream, and after a further ten minutes there is a junction with the left branch being signposted the Vallon de Pratcel. That is our return route, but we take the path to the right. This ascends easily and steadily through the forest below the Roche Blanche, with fine views down the Guiers Vif valley. After a further 40 minutes the path rises more steeply, crosses a fence, passes a couple of potholes to the left, and enters a pasture at a junction (1540 m). Turn right at the junction towards the cabin - the Habert de la Dame, which is reached an hour and half after leaving the car - a good place for second breakfast. The next target is the ridge rising up behind the cabin. Follow the path, and turn left up the ridge, which is the home of some very contented cows. The ridge is easy going, with fine views across the l'Aulp de Seuil. It is adorned with a line of boundary stones dating from 1822 which marked the frontier between France and the Kingdom of Sardinia's Savoy territory - the red and white cross being the coat of arms of Savoy, and the fleur de lys being the official emblem of the kings of France. Savoy was finally annexed by France in 1860. The crête (1800 m) is reached some 40 minutes after leaving the cabin. We turn left. For the first section, there is no path and you will need to follow your nose and the occasional red blob, but there are no real problems. The route follows a superb line along the crête, with dwarf pines and fine views across to the Belledonne. After a bit there is a dip in the ridge with a gully going down to the left. Do not be tempted to follow the gully, but make your way round a small outcrop, and then descend back to the ridge below by means of a short Grade 2 scramble. Some half an hour after reaching the crête, a path is met coming up the cliffs from the left - this is the Passage du Fourneau which can be explored on another day. From here, the route is better waymarked, and more obvious underfoot. The path continues easily, although some care is sometimes required with the navigation, and rises up to a splendid little summit (point 1830 m on the map) with a grassy top and a trig point. Judging from the charred state of the trees, this area seems to be very vulnerable to lightening strikes. The next section of path is very beautiful, traversing a broad ridge with dwarf pines, and hidden glades. The next milestone is the Pas de la Rousse, another route down to the east, marked by a large cairn and a prominent pinnacle topping the northern wall of the cirque. A few minutes later the path starts to descend to arrive at a col after a further 20 minutes. Straight ahead, is another boundary marker carved into the rock. Take the path dropping down the west of the col, and follow this to where it meets the path coming up from les Varvats, close to a fine limestone obelisk. It is now a simple matter of following that path down the valley back to the car, which is reached after some 80 minutes.